Hello my name is Leslie! 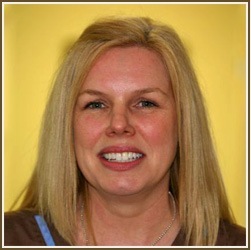 I began my career as a dental assistant in a periodontal office. With additional training and certifications in C.P.R. and radiology, I became an expanded duty dental assistant, and then an Office Manager. In 2001 I found the perfect position as Business Assistant for Dr. Garry Salvaggio. With over twenty years of experience in both the clinical and business aspects of dentistry, I am here to help our patients understand their treatment needs and answer questions about insurance, scheduling, and financial options.